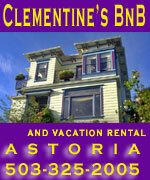 (Oregon Coast) – Now that a particularly interesting moon will be popping up over Oregon skies with the Blue Moon on July 31, perhaps it's time to play homage to our lunar neighbor as it appears above these beaches. Some of it is science. Some of it is just pure scenery. 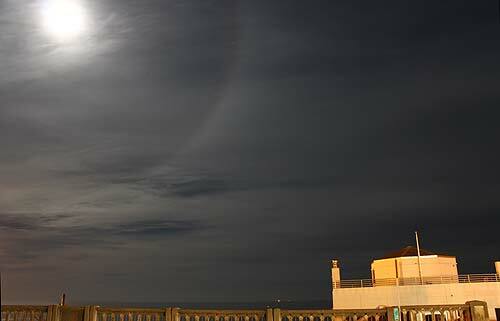 It all begins with this moon halo, taken at Depoe Bay, with the Whale Watch Center beneath it. Moon halos are the result of tiny ice crystals lurking high in the sky, usually around 20,000 feet above and existing as thin, wispy clouds. According to scientists, you probably won't notice these kinds of clouds until night falls because they're hard to see during the day. But their effect on moonlight makes them pop out. Light rays coming from the moon are bent – or diffracted – by ice crystals at an angle of 22 degrees. This means that the light from the moon gets “projected” into a circle, about 22 degrees from the moon. Some halos have a rainbow quality with reds and blues, although most tend to be a giant white ring around the moon. Moon halos like this often mean rain or snow are coming soon, and they are often the forerunners of storm clouds right behind. But not always. The photo above was taken on a September night when the weather was warm, and in fact the following day had sunny skies and temps near a balmy 70 degrees. 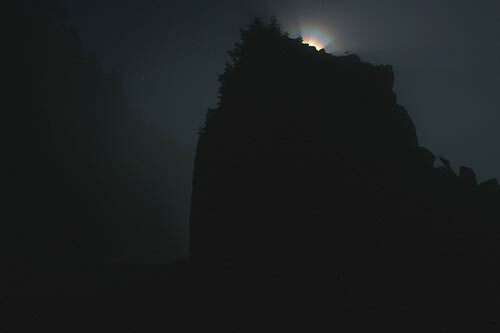 This interesting sight was an experiment above Manzanita, on the Neahkahnie Overlooks. There was plenty of fog on this particularly warm evening, which caused the moon to have a diffuse glow like this as it rose above the pyramid-like rock on top of the overlooks. Add to that scene a car whizzing by and the brake lights of your own car tinting the rock red, and you have this surreal set of circumstances. 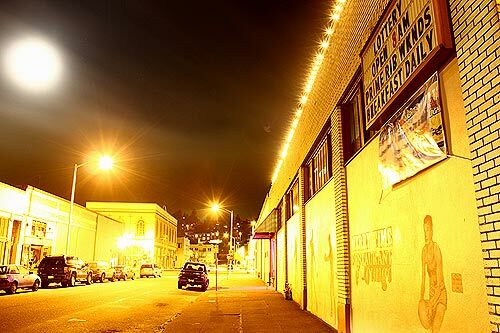 Astoria, rather late at night. 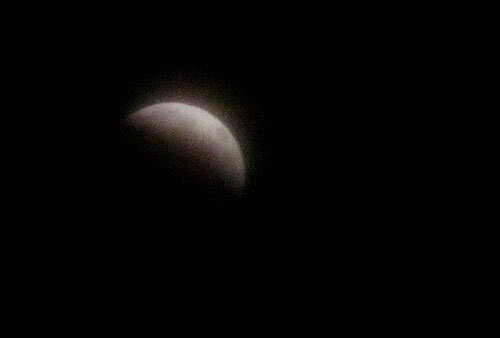 The moon literally seems ready to swallow the sky it's so big here. 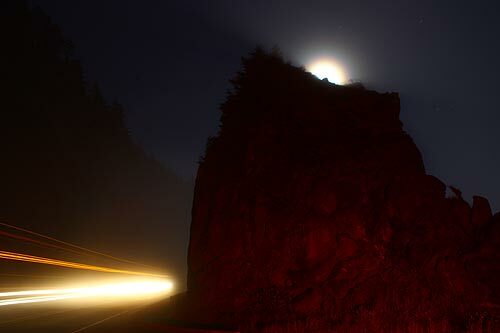 Much of that is the side effect of a long exposure, which causes the glow to be much larger than the moon itself. 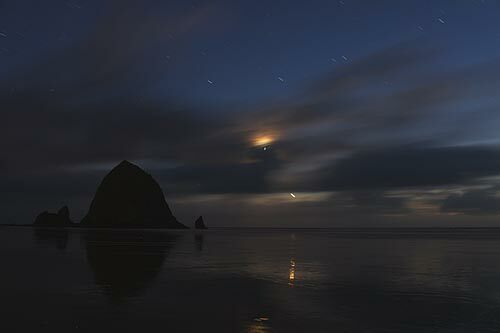 Cannon Beach and Haystack Rock. It's late November on the north Oregon coast. Few things are as captivating as the moon reflected on the ocean, but even more lovely is when it and a star are shining back in the wet sand. Late summer on the central Oregon coast: Cape Foulweather. A bright moon always causes the night sky here to look like daylight when the lens captures it, but you can see this effect a little bit with your own eye when it's not only splashed across the water but when it's all joined by a cloud layer you're able to look down on. 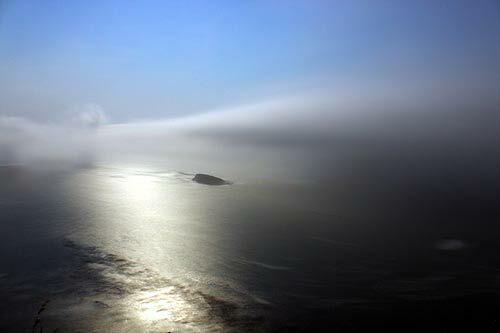 This headland is about 500 feet above the waves, which means the clouds were a tad lower than that.